Welcome to the fourth installment of my Little Mama series. I hope you've enjoyed it! I am in love with how the quilt turned out, and can't wait to see what you think. Another fun coincidence occurred as I was getting ready to make this blanket. I found a coordinating Robert Kauffman print from the same collection as the blue floral in the crib bumpers, a pink fabric called Zany for Zinnias. How awesome was that! I was so excited considering the line was at least 7 years old. 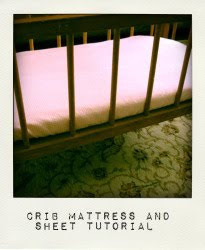 As with each of these tutorials, you can take the instructions and apply them to whatever size crib you are working with...even full size. Just change the measurements based on your needs, the manner of construction applies regardless. This quilt is super easy...and there is no piecing! Let's get started. Two coordinating prints, yardage depends on size you are making. I recommend the top be a flannel. Scraps of fabric that coordinate, cut into 1.75" squares. Basting spray (not necessary, but helpful). 2" Bias tape to cover perimeter of quilt (I'll show you how to make your own). Bias tape maker (if you want to make your own). Sewing supplies (including scissors, pins, sewing machine, seam ripper, hand needle, measuring tape, and iron). Step One. Determine size, and cut out your fabric. For this doll crib, I decided to make the quilt slightly larger so my daughters can easily tuck their babies in. Since the crib is 24" by 12", I went with the size of 28" by 17", so I could fit the squares in a 2" grid. Set the main part of the quilt aside, and cut out the 1.75" squares for your grid. To fit the 28" by 17" quilt shown, I cut out 28 squares. I used a variety of scraps that coordinated with the quilt top and bottom. I chose to use fabrics that were meaningful to me, including scraps from dresses and curtains from my childhood, and of course some of the blue floral. Step two. Baste the quilt and lay out your grid. Lay the bottom fabric down, wrong side up and spray with basting spray. Then, press the batting into the fabric. Repeat with the top fabric, making sure the wrong side is touching the batting. 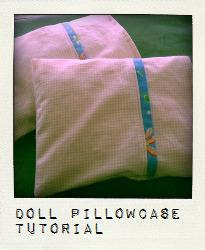 Alternatively, you could pin the layers together and baste with your sewing machine. However, basting this way makes sewing much less confusing in the next step. Step three. Layout your squares. I highly recommend using a clear quilting ruler for this step...it made things much easier to visualize. Lay out your squares in a grid pattern. Each square should be 2" from the edge of the fabric and from each other. Secure the squares to the three layers of your quilt. I used sewing pins, you could also use your basting spray, too. Just be careful as it gets all over when you spray small pieces. Step four. 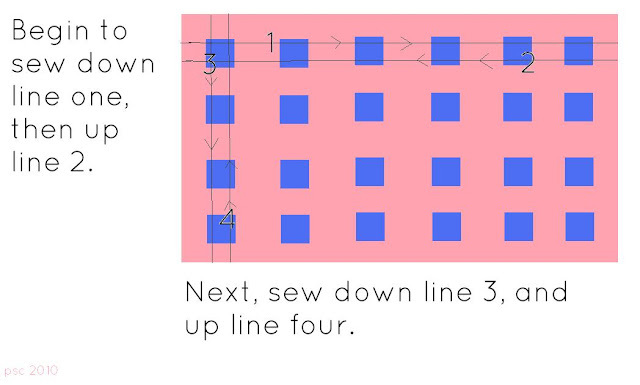 Sew everything in a grid pattern. Using a medium length stitch, sew everything together with a grid pattern. To make the squares kinda wonky, I sewed up one direction and then down in the opposite direction. I sewed down one set of squares the long way, and then would so the short direction the next time, until all the squares were sewn down. Your stitches should catch each square 1/4" from it's edge. As you sew, make sure the fabric isn't getting folded under your needle. Take it slowly, and pull everything tightly between two hands as you go. When the grid is finished, sew along the outer edge of your quilt. Step five. Bind the quilt. There are many ways you could accomplish this. A simple way would be to take a 2" wide straight cut strip of fabric 2" longer than your quilt perimeter and iron in half. Insert over the quilt edge, and then stitch down 1/2". The edge would fray up, and match the squares. How I finished the quilt was to make my own 2" bias binding, and sew it on. I'll show you a brief overview here, but I have a more comprehensive tutorial as part of my Buster Bib pattern that is available for purchase. To make bias tape, I lay out my fabric with the factory edge facing me, and cut up a 45 degree angle. This ensures that I am cutting on the bias of the fabric, or the stretchiest part. I usually cut about 25-30". Next, I fold the fabric in half or quarters so the cut edge is out, and then cut up strips 2" wide. Put the strips right sides together at a 90 degree angle, and sew with a 45 degree angle seam. Trim any extra fabric and thread. Continue until you have enough tape to cover the perimeter of your quilt plus 4 inches. The final step of making bias tape is ironing it into the correct shape...I highly recommend a bias tape maker. It's one of my favorite sewing tools. You can also fold the tape in half and iron, then fold in each side to the center and iron again. Ready to attach your binding? Fold over the bias tape 1/4" and begin pinning the tape onto the top of your quilt, right sides together. Next, fold over the tape to make a 45 degree angle. When you reach the starting point, extend the tape beyond your first fold about 1" or so. Now, sew the bias tape to the quilt. You'll want to follow the iron mark, just inside about 1/8". For the corners, step sewing when you reach the corner pin, and stay stitch. Lift up your needle, and fold the corner over the other direction, and begin sewing in the same spot you stopped, just down the next side of the quilt. Continue and repeat for the next three corners. When you come to your starting point, sew past about 1", and then trim any extra tape. Working from the back of the quilt, fold over and pin the bias tape so that it covers your seam. With the binding pinned, use your best blind hem stitch to finish the quilt. Once the binding is in place, your quilt is finished. You've created an heirloom quality quilt for your daughter's dolls. To finish the love note to my girls. I want you to know you can't have it all. I want you to be accomplished and get all the education you can. The world will lie to you and say you can have it all and do it all at the same time. You can't. You can't have a powerful career and be the kind of mother you want to be, or that your babies will need you to be. There is such a thing as a biological clock. However, if you prepare and are wise, you can do everything you want to do. It's all about timing. Choose a career that will allow you to keep current, but take a break for babies. Know that the time you'll have with little children goes very quickly. Enjoy that time, and still find ways to build up your skills and talents while nurturing your children's talents as well. Then, when your children are grown, you'll be ready to re-enter the workforce, and have the wisdom that comes from being a mother as part of your toolbox for that next part of your life. I love you so much, A & N. Be strong. Prepare, learn, grow, and look forward to the day when you are a mama, and I get to be a granny. 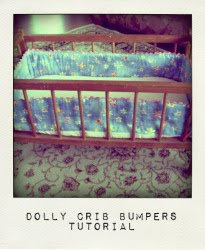 Here are the rest of the tutorials my Little Mama Series. Featured on Those Northern Skies. Featured on Craft Gossip and Totally Tutorials. Linked up to Somewhat Simple, House of Hepworths, A Few of My Favorite Things, Kojo Designs, Those Northern Skies, Just Another Day in Paradise, and Skip to My Lou. This is pure genius! What a darling quilt and soooooooooo quick. I have some homespuns just begging to bemade into this sweetie for my soon to be grandson. Thank you so much for sharing. What a beautiful quilt! Your daughters are going to treasure it. Your tutorials are just wonderful, too. hi there, love all of this and hope to make it for my daughter as well. was curious about the doll shown tucked in the bed. the one with the bald head and few strands of hair. did you make that as well? is there a tutorial? thanks! Lori, the dolly pictured is from Pottery Barn, at least 7 years ago. My eldest girl got her for Christmas when my cousin worked at PBK...ahhh, discounts! So, no tutorial for now. I might get crazy and try one some day...but it might be a few years from now. :) I would love to see what you come up with. Please be sure to email me or post them to our little Flickr pool. Vicky & Andrea, thank you for your sweet comments. You really are amazing...this quilt is gorgeous and you made your own bias tape!! Nuts!! But what melts my heart is the note to your little girls - it is so true.